A year ago, Hurricane Maria slammed into Puerto Rico, devastating the island and leaving its residents in desperate need of emergency assistance. Whole communities were wiped from the map, hospitals were forced to perform medical procedures by candle light, and without power families were unable to contact each other. It would be almost a year before reliable electricity would return to the island. Even as Maria barreled down on the island, The Salvation Army was already there and preparing for the aftermath. The Army serves in every zip code and area of the United States and its territories, so we are better equipped to rapidly respond to the unique needs after each disaster. Although travel into and out of Puerto Rico was halted, Salvation Army staff, volunteers and supplies were making their way to the ports to sustain response and recovery efforts. Captain Richard Forney, officer at the Aurora Corps Community Center, was among the first group of people deployed to Puerto Rico. While Captain Forney was helping survivors in Puerto Rico, The Salvation Army was also serving those who were displaced by Hurricane Maria, here in Chicagoland. We welcomed families and helped them find shelter, enroll children in schools and access community services. Families were also registered for the Army’s Christmas program which included a full Christmas dinner and Angel Tree gifts for the children. The Salvation Army is still helping families in need. Wilmena, her partner and their two grandchildren relocated to Chicago from Puerto Rico, but had nowhere to stay. They were referred to The Salvation Army’s new Shield of Hope emergency family shelter and provided a hotel-like room with comfortable beds, a private bathroom and a sitting area. Additionally, the staff helped Wilmena and her family find affordable and safe apartment on Chicago’s north side. They have recently moved, the children are in school and they are grateful for the Army’s support. 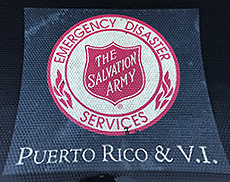 The Salvation Army is still serving in Puerto Rico as a part of Operation Lasting Hope and expects to remain there for a decade. The Salvation Army’s Emergency Disaster Services.